How is Humanism targeting Christianity? One of our speakers was Dr. Ron Rhodes, the president of Reasoning from the Scriptures Ministries. He's a prolific author of more than 50 books. He holds a doctorate in systematic theology from Dallas Theological Seminary, and he specializes in the field of Apologetics. He also serves as an adjunct professor at several seminaries. Dr. Rhodes' topic at our conference was "The Challenge of Humanism and Atheism" (watch). Anybody excited about Jesus? How about the Bible? Are you excited about the Bible? Anybody standing on the promises of God? Then you are a bunch of fanatics. Just my kind of people! Talking about something a little more serious, I've got to tell you I do believe that Christianity is in the crosshairs today. Today Christianity is under attack and I believe that Humanists and Atheists are on the front lines. In fact, I can tell you that they seek to erase Christianity from our culture today. What are the targets? Well, the targets would include, for example, Christian holidays like Easter and Christmas and Nativity scenes. You have seen lawsuits launched against businesses because they have a Nativity scene displayed out front. Christian morality is also under attack. 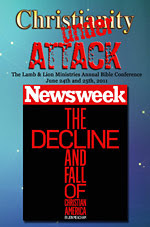 The Christian Bible is under attack. In fact, Humanists and Atheists say that it is a vile book filled with ethical barbarisms. It's an ancient book written by superstitious men and it wasn't even true back in biblical times. To them, it's a false book. Even Christian crosses or crucifixes are under attack. And, as well, Christians are under attack in terms of the influence that they want to express in schools, education, government, public policy, Hollywood, the media and much more. You see, the Humanists want to marginalize Christians. They want to make Christians irrelevant in the current dialogue and debate. In the process I believe there have been many denials of Christian freedoms especially at the work place. An example of denying Christian freedoms is a Christian apartment owner that I read about. This Christian apartment owner was actually prosecuted for refusing to rent an apartment to an unmarried couple. Now, this person owned the apartment building, and this is a person of virtue. This Christian wanted to make sure that the people who lived in the apartment building had a clean life and were reasonably responsible people. But, he was prosecuted because he refused to rent to an unmarried couple. To put it a little more strongly — he was prosecuted for not allowing a couple to go in there and commit fornication within the walls of the building that he himself owns. Christian freedoms are under attack. Another example, I'm thinking about the sixth-grade elementary school girl who gave an oral report on the Bible. Now, you know sixth graders can be excited about things, right? So, she brought some extra copies of her book report and any student who wanted it she gave a copy right after class. Well, shortly after, a teacher barged in and escorted this young girl to the principal's office and she was interrogated by school officials and denied the right to call her mother. Now, do you think that she's remembered that ever since that happened? And, do you think she's going to remember that her entire life? I think she will. It gets worse. I'm thinking about the six year old student I read about. The six year old students were taught to bring in their favorite books for show-and-tell. They had show-and-tell back in my day and that was back in the days of Moses. I remember very clearly how excited we were to share the things that we brought to school. Well, here we have this little six year old student who brought the Bible because the Bible was the most important book to this child's family. He brought the Bible in and then he was told to take it home because it was against the law because you can't mix religion in the school system. Do you think that he has remembered that and will remember that for the rest of his life? I think so. This is the denial of Christian freedoms. I'm also thinking about the graduating senior who had perfect grades. She had a 4.0 average, and yet she was denied the right to give an address to her graduation class. Why so? Well, because she had a sentence in her speech that gave credit to Jesus for bringing meaning into her life. Sharing the religion of Humanism at a graduation, that's okay, and any other false religion, that's okay, too. But, you've got to keep Jesus out of the picture. That bothers me. I'm also thinking about the church school run by a Christian preacher who was ordered to close it because the teachers in the school program did not have a state certification. Now, this is not a religious certification or a spiritual certification or a biblical certification, this is for a secular state certification. If you don't have a state certification they will close you down. That's basically what happened. This was a preacher with a conscience. He felt that he was doing the will of God in setting up this church school. After all, he just wanted to train his young people in Christian doctrine and Christian virtues. That's what we need, isn't it? And yet, society and the government officials came against them. In fact, during a prayer vigil for the school, the local sheriff and his deputy showed up and took them off to jail and then padlocked the church. It's so obvious to see that Christianity is being attacked in the media. I'm sure that you've seen on the big screen and on the small screen how Christians are often made to look like imbeciles. Very often on news programs you will find Christians referred to as the "Religious Right." That's a term that implies that all of us Christians are intolerant, backwoods fanatics who don't use their brains. Meanwhile, the Humanists are portrayed as enlightened intellectuals. You see, this is what I'm talking about concerning the denial of Christian liberties. I think it's going to get worse. It's going to get worse, and I tell you what, the middle ground is going to get smaller. You will either stand for Jesus Christ or you won't. Will you join me? Will you stand for Jesus Christ in the midst of the onslaught? 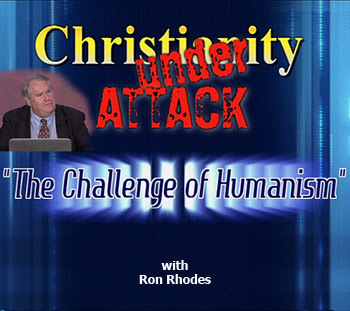 In the next part on this series with Dr. Rhodes concerning the challenge of Humanism, we'll look at its foundational core belief. Soon, there will be no more "fence riding." We must choose whom we will serve. Will we choose to be like Paul or will we betray Jesus with a kiss? I have lost friends and been isolated at work for going on 25 years because of my stance on Christian beliefs. I have not missed the company of these people one bit. And it's about time!!! All religions are insane, the Dark Ages, killed thousands if innocent people, because of sick christianity. Jim Jones had his followers killed because he was insane. I have lots of friends that are christians but just you tell them you believe different and they go off their rocker, selfish, self-centered people. "But as the days of Noah were,so also will the coming of the Son of Man be." The worst mass murderers in all of history were secularist or aethists. This is a fact for anyone who knows history. Will you now condemn all non-religious people with the same vile words you used against Christians? That isn't my main point of discusssion, just showing you your rant is irrational, inaccurate and irrelevent. My main point to you is Christian have nothing but your best interest at heart. And that is the destiny of your soul. We spread the Good News of Jesus to let you know that He died on the cross for YOUR sins that you will not perish but live forever without hunger, thirst, hate, pain, suffering, etc. You can have eternal life just by placing your faith in Jesus and accepting His gift to you...His sacrifice on the cross. Is that so bad, Anonymous? Does that hurt you? Why? God loves YOU so much that He sent His Son Jesus to DIE for you that YOU may LIVE! That is what being a Christian is about...not condemning you. All of us are condemned by OUR sins, not the words or judgements of others. I am condemned by my sin and I deserve what the Bible says are the wages for sin...death. But the blood of Jesus has pardoned me, wiped away my sin and given me hope and joy in life. That is what Christians want for you. We don't want you to have to pay the price for your sins, we want you to be forgiven as we are that you may know the Lord Jesus and find peace. That is love, my friend. That is what we Christians hope to share with you. And, it is up to you to decide to accept the gift of Jesus or decline. I have prayed that you will know the love of Jesus and accept Him into your heart. From a Christian who reaches out to you in compassion. Does the majority of the people on this website believe in once saved always saved? Iam just curious.